Gardens where escalating amounts of rubbish has been dumped can cause pest problems and can visually cause a lot of unhappiness. Garden Clearance work allows a space to be transformed through the removal of waste and the clearance of weeds, unwanted shrubs and trees. When a garden has been unmaintained for even a short period of time it can become difficult to work through the build up of waste that can accumulate in a garden space. Often this can be waste left by passers by or previous owners that need to be removed before it will be possible to redesign and re-use a space in the garden. Sometimes having many garden tasks can seem overwhelming and make it difficult to complete alone. 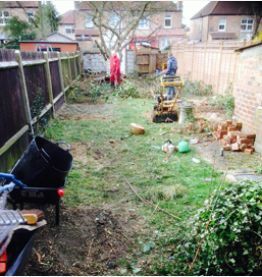 A professional garden clearance service can help to see results a lot faster and make it easier to plan how to make use of a garden once overgrown areas have been made clear and rubbish removed making unused space accessible again. The reward for both property owners and our team can be seen once a garden starts to take real shape. These are exciting times and within two days a transformation can be completed and successfully make a space ready for action.